You can get access to reputable Ramsey driveway repair services when you call (201) 327-5258 today. We will send a licensed contractor to your home or business to offer a free estimate and go through your options for a practical solution. Find valuable online coupons and specials when you click here now. Just like any asphalt surface, your driveway will age, weaken and break down over time. The weight of parking your vehicles on it every day and the fact it is out there in the elements 24 hours a day will cause fading, cracking, depressions from the car tires and general wear and tear. In order to get it back to its original condition both functionally and aesthetically, driveway repairs are a good idea. Your neighbors have been talking about our asphalt and paving services. Click here to find out what they’ve been saying. When you start getting a few cracks in your driveway, water can get inside them and settle. In places like New Jersey that experience a wide range of temperatures, the water in the driveway cracks will expand and contract, creating more cracks that end up compromising the integrity of the driveway. It might look interesting to see grass growing out of the cracks in your driveway, but if you do see that, you know it’s time for repairs. Sunlight that bleaches your driveway is an aesthetic issue that you’ll want to address, but grass that encroaches from your lawn or other area will cause physical damage. The roots can cause holes by growing into the driveway, and those holes will soon fill with water. If there are already cracks and water in the driveway, this situation may become even worse as the grass roots grow toward the source of water. Many homeowners don’t find the cracks, grass, faded color and holes that big a deal, but the more damage that is done to your driveway; the more your original drainage system will be compromised. When the asphalt is crumbling and breaking apart, the slope and grade of the driveway may be altered, causing the water to pool or worse, run toward your house. If water ends up getting inside your house or garage from faulty drainage, you may end up with mold and extensive property damage. If you see signs of cracking and damage on your driveway, call your local paving contractor for help. If your driveway is damaged and needs repairs, it won’t get fixed all on its own. 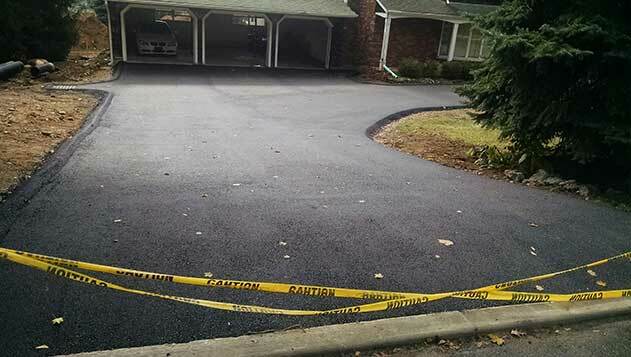 Call McFarlane Asphalt at (201) 327-5258 in Ramsey, NJ and the surrounding area and we will provide you with the repairs you need to make your driveway look like new again.